Blue Jays pitcher J.A. 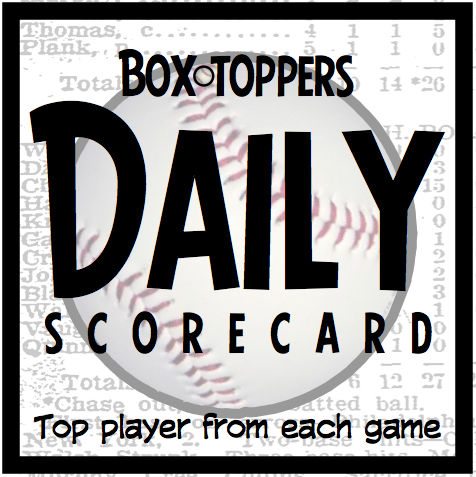 Happ is Tuesday’s Box-Toppers Player of the Day. Also Tuesday, Yankees pitcher CC Sabathia earned Box-Toppers points in his 18th straight season after earning Player of the Game honors, setting the record for longest such streak among pitchers (since 1995 when Box-Toppers tracking began) and taking sole possession of the longest active streak. Player of the Day—Happ struck out 10 over seven innings, allowing one run, four hits and no walks, in the 4-1, 10-inning win over the Red Sox. Happ picked up a no-decision and did not earn the win because the Red Sox tied the game after he exited. Happ earns 2.0 Box-Toppers points for being Player of the Day, giving him 3.0 for the season, most among Tuesday’s Player of the Game winners, rising to 22nd place in Box-Toppers season player rankings, 10th among American League pitchers. National League Player of the Day—Rockies pitcher Kyle Freeland struck out eight over seven scoreless innings, allowing three hits and two walks, in the 8-0 win over the Padres. American League Batter of the Day—Andrelton Simmons of the Angels hit two homers and went 3-for-4, scoring twice and driving in five runs, in the 8-7 win over the Astros. National League Batter of the Day—Alex Avila of the Diamondbacks homered and went 3-for-4, scoring twice and driving in two runs, in the 8-4 win over the Phillies. Avila narrowly won NL Batter of the Day honors over Ian Happ of the Cubs (Player of the Game in the 10-3 win over the Indians). Both Avila and Happ had practically identical performances (HR 3-4 2R 2BI). Both also had no walks and one strikeout. But Avila earned NL Batter of the Day over Happ because he left fewer runners on base (zero vs. one). Here are the players who have earned Box-Toppers points in the most consecutive seasons. CC Sabathia Tuesday extended his streak earning Box-Toppers points to 18 straight seasons, tied for the third-longest since Box-Toppers tracking began in 1995. It is now the longest active streak (passing Albert Pujols) and the longest streak by pitcher (passing Mariano Rivera). Players are listed by length of their streak. Also shown is the duration of their streak and their career Box-Toppers point (BTP) total. Active streak of a player active in 2018. Streak—Yankees pitcher CC Sabathia has now earned Box-Toppers points in 18 straight seasons after earning his first Player of the Game honor of 2018 Tuesday. That is tied for the third-longest streak in Box-Toppers tracking history (begun in 1995), sets the record for the longest streak by a pitcher and is now the longest currently active streak. Sabathia (6IP 2H R 0ER BB 4K W in the 8-3 win over the Twins) earned his first Box-Toppers points in 2001 with the Indians and has 193.7 career points, fifth among all players since 1995, when Box-Toppers tracking began, now only 0.4 points behind fourth-place player Curt Schilling (194.1). Sabathia ranks second among active players in career points behind Dodgers pitcher Clayton Kershaw (209.8). Sabathia now has the longest streak by a pitcher in Box-Toppers tracking history, passing Mariano Rivera, who earned Box-Toppers points for 17 straight seasons from 1995 to 2011. Sabathia also takes sole possession of the longest active streak. He was tied with Albert Pujols of the Angels, who also had a streak of 17 straight seasons earning Box-Toppers points (2001 to 2017). Pujols has yet to earn Player of the Game honors this year and so still has the chance to tie Sabathia at 18 straight seasons if he earns Box-Toppers points this season. Sabathia’s best season was 2008 with the Indians and Brewers when he had 26.7 Box-Toppers points to lead all players. In 2017, he had 7.7 Box-Toppers points, 26th among AL pitchers. Debut—Giants pitcher Reyes Moronta made his Box-Toppers debut Tuesday with his first career Player of the Game honor. Moronta (2IP H 0R 0BB 2K W in the 4-3 win over the Nationals) made his Major League debut Sept. 5, 2017, and was playing in his 18th career game. He is the 3,944th player to debut in Box-Toppers since record keeping began in 1995. Scoring—J.A. Happ earns 2.0 Box-Toppers points for being Player of the Day and Freeland earns 1.7 points for being NL Player of the Day. Simmons and Avila each earn 1.5 points for being their league’s Batter of the Day. All of Tuesday’s other Players of the Game (listed in the chart below) earn 1.0 Box-Toppers point.